It’s hard to be a fan of the celebrity cancer confessional. Apart from the similarity to watching a sports match where you know the likely outcome, and that disease should at least be the great social leveller, you also wonder about priorities i.e. how would you like to spend your last year, doing stuff with people who are important, or writing a book? 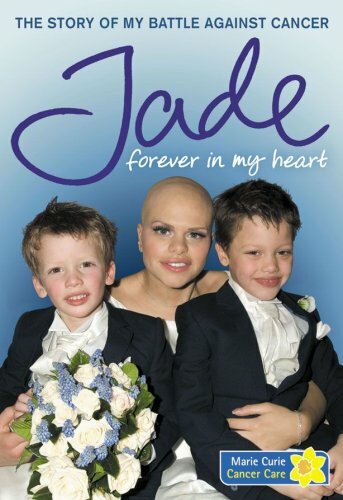 27 year old Jade Goody, British Big Brother reality-TV celeb, didn’t face that sort of choice – she had a ghost writer. However other books like Randy Pausch’s “The Last Lecture” (below) would have meant a much higher degree of personal involvement. Before dying in a hail of bullets from JG fans (my autographed Michael Jackson poster is on the wall just left of my framed Princess Diana photo) there’s no question that having a terminal illness would concentrate your mind on the things that are important in life. The consequences for the author’s family might be not quite as intended (a grandparent I know caused consternation by writing a children’s novel shortly before dying with various thinly veiled portraits of family members and even mixed generations in the same story) but it’s still a family legacy of sorts. Admit it or not, most people quite like to participate in a tragedy (if not personal) much as we like to watch a good crime TV episode, and deep down maybe even hope that it will give us a bit more perspective on own lives, or at least make them look better… (my own explanation for the implausible appeal of horror movies). Yet despite the fact that we’ve heard the phrases ‘live each day as if it was your last’ or ‘life is a terminal illness‘ 1.1 million times it’s hard to focus on the important things. Even where you’ve had a life-threatening illness, accident or just plain high-risk moment, the effect wears off rapidly within a year or so and you are back to obsessing about whether you are getting the best interest rate on your term deposits. The things that you really want get deferred (a baby-boomer I know actually plans to start writing their novel at 65 – a lot harder to do the mental rewiring necessary at that age). And, let’s face it, it is genuinely important to generate the cashflow to support a family, or save the income to support the 20 to 30 years of old age that most of us face. We can’t spend all our time sculpting. Our own death: not something to think about? Thinking and reading about other (interesting) people dying like Randy Pausch might well be ok, but thinking about your own death is surely maudlin/depressing/unhealthy and perhaps downright self-indulgent? After all, a positive mental attitude even makes you live longer? We…ll (as Samantha on ‘Bewitched’ used to say) maybe a little thought about death could be useful at times. For example it’s worth being aware that if you’re going to work 6-7 days a week to put together a pile of cash, it is quite possible you won’t be around to spend it. Well there are some rather emphemistically named ‘Life Tables’ (because they’re more like ‘Death Tables’) which give you an idea of what the death risk might really be for you as an individual (see below for 2003 figures for the USA). For example, more than 1 in 10 of our aforementioned 65-year-old novelist’s classmates will already be dead by the time he puts pen to paper, and he personally has around a 6% chance of dying between the ages of 60 and 65 alone. These are quite appreciable risks: your peers may well do riskier stuff than you do but the fact that 1 in 20 will be dead before 50 bears thinking about. This is not like taking 20 bets on sharemarket stocks and knowing one will be a big loser – this is a bet you don’t come back from. As you can see from the table the risk accelerates somewhat from around 55 onwards. Still feel there’s definitely going to be time later to do the things you want to do now? A risk also worth thinking about is the risk that you don’t die but end up incapacitated, uncomfortable, or off-your-tree for a considerable period in old age (yeah possibly you can’t appreciate the distinction then) and if you’re 80 to 85, realizing that half your friends won’t attend your funeral (unless it’s in the same cemetery because you’ve already been to theirs). There’s a nice little ‘how long will I live’ calculator at Penn U where you can plug in your own characteristics like gender, diet, where you live, stress, travel etc and be given an approximate year of death for your personal circumstances if you want to delve into personal risk factors (medical information on the internet is ranked inappropriately but that’s another story). What you might find most scary using the calculator is not when you’ll die (assuming any reader of this sort of article is a risk-averse individual who tests the depth of a puddle before stepping in it) but the odds of living too long… For example, my personal estimate includes a 25% probability that I will live to 95 or longer (the prospect of funding 30 years of retirement … great!). Unlike the risk of premature death it’s difficult to know what to do about living past your sell-by date. It’s all very well to think that an extra bottle of pills will help you out when the time comes, but even if you’ve got the means and intellectual capacity to carry it out, the will to live is pretty strong even when the quality of life is crap.